Our diverse portfolio of boutique holiday villas is perfect for couples or families in search of affordable exclusivity. Learn more about the benefits of renting your own private vacation home. When looking for Phuket Villas or Koh Samui luxury holidays then you have found the right website. Looking for the perfect retreat away from the crowds and yet within reach of recreation, shopping and entertainment then Thailand is a must place to go with two of the main resort Islands will proved all that and more. 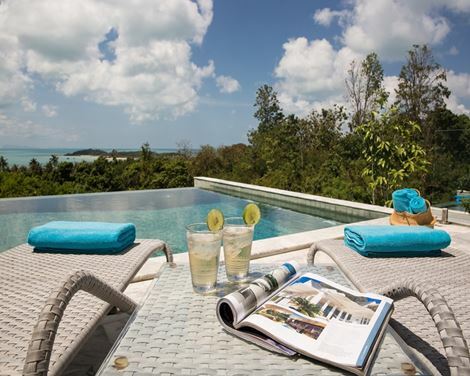 The Boutique Villas is an exclusive selected portfolio of exclusive Phuket Villas and Koh Samui Villas and apartments. When you choose one of our villas you will experience an exceptional private residence in breathtaking surroundings. These prestigious serviced properties are locally managed by our main two offices in Thailand - Samui Villas & Homes Ltd and Phuket Villas & Homes Ltd. This which ensures that highest standards in both the properties and services is maintained at all times to meet guests' needs. That's why Koh Samui rentals and Phuket rentals provide the highest level of luxury and comfort. Our Phuket villas are an ideal choice when planning your vacation for those wanting to enjoy Phukets tropical climate. Phuket luxury villas are becoming more and more popular with discerning holiday-makers with a wide range of direct flights to the Island, while Koh Samui luxury rentals suit those in search of privacy and indulgence. The Boutique Villas are all located either on or within minutes of a beach and all our Koh Samui and Phuket luxury property offers sea-views. Not only are theses villas in stunning locations, they also offer more than you could ever expect for a Phuket holiday rentals, providing the kind of services and facilities offered in 4 and 5 star hotel accommodation. By providing such unique and comprehensive services in our Phuket and Koh Samui villas for holiday, we ensure that our guests experience value for money, exclusive service and a private escape for vacations or special occasions that will never be forgotten. Take a look at our online portfolio Phuket Villas and Koh Samui then send us an enquiry and one of our dedicated villa specialists will assist you with your villa holiday choice.